As international traffic increases and upscale overseas airlines begin to extend their first-class service beyond the cabin doors, San Francisco International Airport has taken notice-and action. In March, it launched the one-year pilot of a paid concierge service for passengers traveling on any airline, in any class of service. Airport Butler, a division of Airport Terminal Services, is providing the program, and early reactions to the new offering seem promising. Currently, SFO's Guest Services Group is managing the pilot under a non-airline permit agreement. If the program proves viable, the airport plans to put the business out for bid as a concession that will likely continue to be administered by Guest Services. Sample Services: Personal meet-and-greets; wayfinding assistance; language translation; ground transportation/concessions procurement; etc. A marked increase in premium-service traffic from Turkish Airlines, Emirates and Etihad Airways inspired Christopher Birch, SFO's guest experience director, to explore the concept. Birch was intent on matching the elaborate and personalized service select passengers experience at their originating airports in Abu Dhabi, Dubai and Istanbul. "We didn't want that disparity between the experience on one side and the experience on the other," Birch explains. "We have a nice airport and a nice terminal, but it is a different experience here (in the United States)." The differences were further punctuated when a handful of international airlines began providing certain SFO passengers with premium parking and limousine services through agreements with third-party operators. The "Emirates Experience," for example, offers complimentary "chauffeur-drive service" within a 60-mile radius of the airport for first- and business-class passengers. When Birch began hearing about the upgraded services international carriers were providing, one thought immediately popped into his head: "We really should be doing this." "The airport had been without any sort of formalized service to provide extra attention, extra service or extra assistance," he explains. "We wanted to make sure that we had something in place where customers could get that level of service if that is something that they want." SFO subsequently created a pilot program, with Airport Butler acting as an extension of its own Guest Services group. Airport Butler is owned and operated by Airport Terminal Services, which provides a variety of passenger and ground support services at roughly 50 U.S. airports. The company also operates a fee-based passenger lounge in Terminal 4 at John F. Kennedy International Airport. Ingrid P. Braeuninger, vice president of Sales and Business Development for Airport Terminal Services, considers Airport Butler a strategic result of the company's continued efforts to diversify its product portfolio. "We wanted to stay adjacent to who we already served, which was the airports and airlines, but also wanted to start tapping into the market for direct business with the consumer," Braeuninger remarks. Airport Butler began serving North American airports in 2013, when the firm won an exclusive permit to create an extension of the customer service and concessions program at Vancouver International. The airport authority wanted to elevate the experience for customers passing through the terminal, Braeuninger explains. "(The Vancouver contract) was an awesome opportunity for us to partner with a pretty innovative airport in creating the service from the ground up," she relates. "By the time we got all our protocols and directives in place with stakeholders like Customs and Immigration, CATSA, and the airports and airlines, we really then were able to launch a better service to the consumers." Intrigued by results in Vancouver, SFO approached Airport Butler for a similar program, explains Braeuninger. 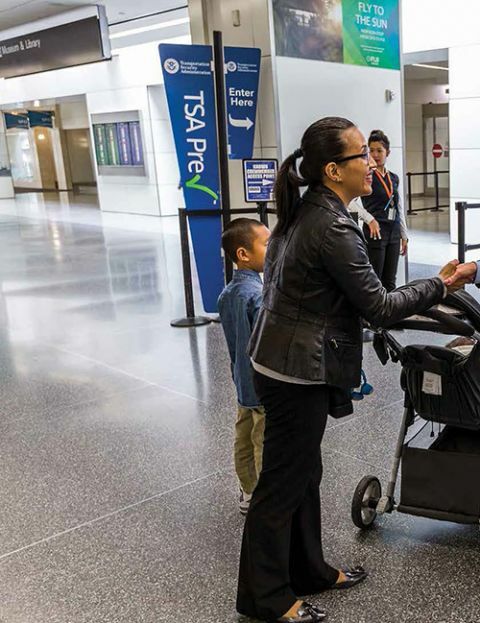 Beyond wanting to improve the customer experience, officials also wanted to differentiate SFO from other airports competing for the same carriers and routes, she elaborates. The services provided by Airport Butler range from personal meet-and-greets to assistance with language translation, ground transportation and baggage delivery. Many options mirror those offered to premium customers by Emirates and other air carriers. Airport Butler's base retail rate of $250 includes three hours of dedicated service-a window engineered to cover most connections and pre-departure needs. In general, services are covered by more than $300 million in general liability insurance. While overseeing the program, Braeuninger has helped fulfill a variety of client requests-from securing a discrete, private room to accommodate the cleaning of a medical feeding tube, to ensuring that ice-cold kosher pickles were available immediately upon arrival. "Our job is to think of ways to make things easier," she remarks. "A lot of times it is off-the-cuff, and sometimes we have plenty of time to prepare. But there really is no limit as to what we can do to help our customers." So far, departure assistance is the top request at SFO, followed by support during connections and arrivals. No other discernable trends or patterns have emerged yet, but the service is still new. Ultimately, the airport and Airport Butler hope the company will help expedite passengers through traditional pinch points such as Customs and TSA checkpoints. According to Birch, inroads are already being made with the necessary governmental agencies to achieve that goal. "We've secured access to the Customs and Immigration Area, allowing Airport Butler staff to meet and greet arriving guests and assist with entry formalities," he reports. "There is enormous value in being able to offer this service to guests, and we expect a broad variety of customers to request it." Braeuninger notes that Airport Butler does not have a "typical client." Customers range from VIPs and business executives to senior citizens and families in need of additional assistance, she explains. Walk-up service is available, but most arrangements are booked in advance online or through travel agents. Although SFO is just beginning its trial of paid concierge service, Birch is optimistic about the concept. "We chose the year-long pilot program to allow for the opportunity for this to percolate here and become a well-known service offering," he says. "We certainly think Airport Butler is a worthwhile vendor and we believe strongly that the service will be successful in the long run." In fact, he hopes it will be a success that other airports will emulate. If more U.S. airports begin offering concierge-level service options, there will be better synergy between passengers' origination and destination experiences, explains Birch. "I don't know what its usage is going to be like, but I think that it has found a place in the U.S."